Not content with the bottling line, we felt that the area in the centre could be utilised, so we manufactured a pack divider, suitable for seamlessly seperating boxes, packs or cases. 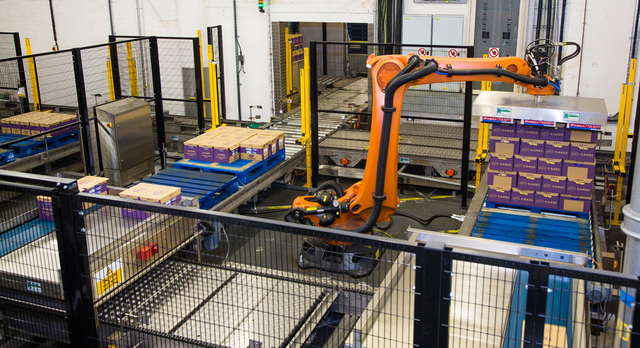 We supplied a multi robotic palletising systems for a major UK food manufacturer, this was built and pre-tested at Kensal's manufacturing and assembly plant in Luton to enable a fast installation on site. 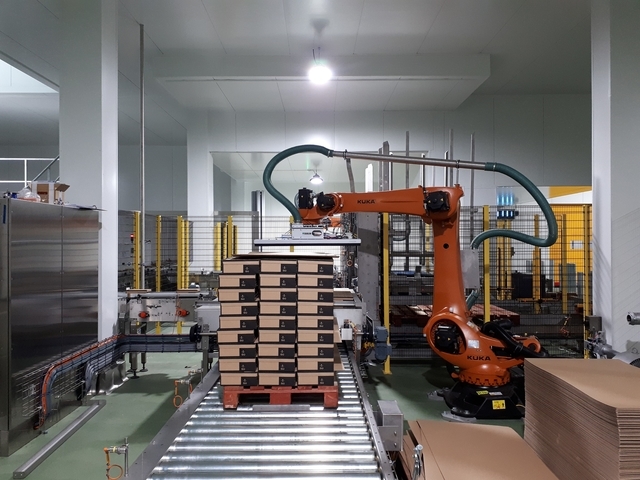 The system incorporates 3 large Kuka Robots and Kensal's stainless steel conveyor for packs, empty and full pallet handling. The robots had a custom in-house designed vacuum head, to gently and accurately lift the display ready packs onto the pallets without any damage. The custom head, which is critical to all robotic applications, was designed to be able to lift in 9 independently controlled zones each with its own feedback system to ensure full control whether lifting a single box, a row or a complete layer. This is only one of many Robotic systems we have integrated into the food and drinks industry over the past 14 years when we first used them. Kensal Handling Systems have installed a major contract with a global manufacturer of automotive catalytic converters. The storage system, comprised of two triple tiered bi-directional conveyors, which gently handle the catalysts as part of a buffer system, loaded by robots, it is used to optimise their continuous production. 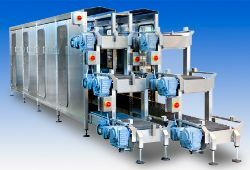 The lines have required numerous different conveying products to be used to optimise the layout and handling at the different stages of production. One interesting challenge was transporting the shrink wrapped packs from one building to another, requiring over 400metres of conveyor of different styles to handle height changes, pack accumulation etc. Kensal are nearing final commissioning of multiple production lines for a premium brand of Dessert manufacturer. 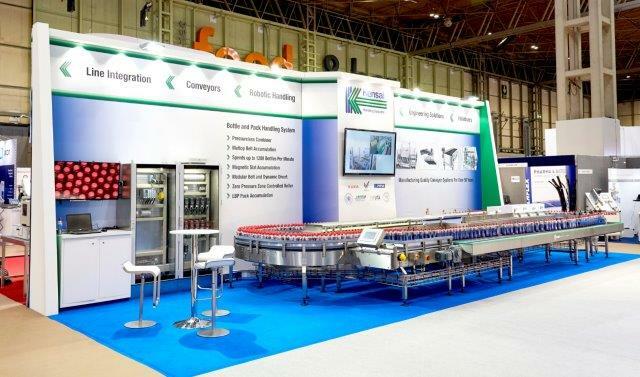 With numerous lines, for handling the product at different stages of production and integrating a diverse range of machinery, Kensal were responsible for ensuring the tasty dishes made it safely around the entire production system. We handled the product empty, filled prior to sealing, sealed, frozen, wrapped into individual packaging, into cases and then finally palletised. 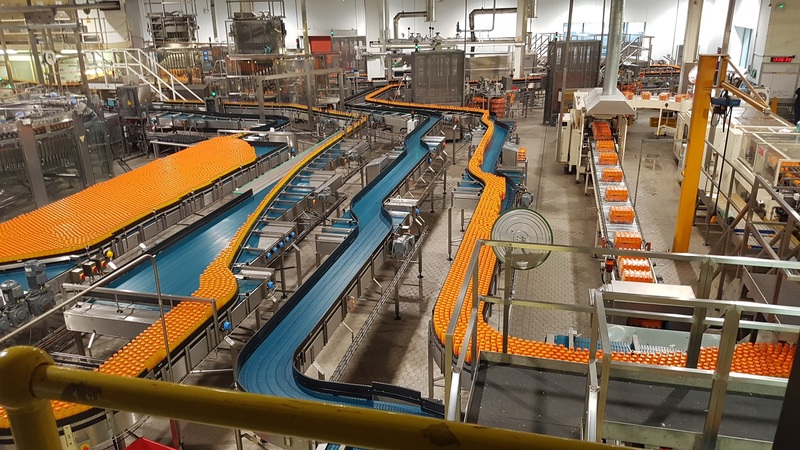 To integrate all of the equipment on the production lines, Kensal supplied a broad range of conveyor types to suit the product being handled at each stage including six complete robotic cells and various other specialist pieces of equipment. The whole system is controlled by multiple PLCs that comunicate with each other and a central production control system. Kensal have just completed installation and commissioning of a UV system for sterilising the outside a a range of containers transporting product from low care to high care. The cotainers were up to 500 wide and 500mm high. Due to the high power of the UV light system, Health and Safety issues were paramount and independantly tested to ensure that the system is safe. The design of the main UV chamber allows operators to see inside, through a UV proof window. To assist in maintenance and allow access to the UV lamps, which completely surround the product as it passes through, the lamps are mounted on a pull out track system. The fully interlocked guarding and floor is removable to allow for easy cleaning. Kensal Engineers Attention To Detail.